Who doesn't look for new ways to save money? When it comes to energy matters, we'd rather invest in new air conditioning units with inverters & central systems with thermostats instead of paying large amounts of money for energy bills. It's the best we can do to save some money, get more satisfying results from the HVAC system and help the green environment recover. But then we get the new energy bills and the numbers are still high. Sometimes, we see only the tree and fail to see the forest. Some matters are interrelated. Take your HVAC unit, for example. You cannot rely on its efficiency if the air ducts are not checked as well. Ducts and heating, ventilating and air conditioning systems go together hand in hand. When you take care of one, you most likely have to take care of the other. This is not a rule though. If you need HVAC unit repair when the cooling fins are bent, you don't necessarily have to check the ducts, too. As an overall, you must be certain that the whole system is clean and free of problems and such things are possible only with annual air duct and HVAC maintenance. 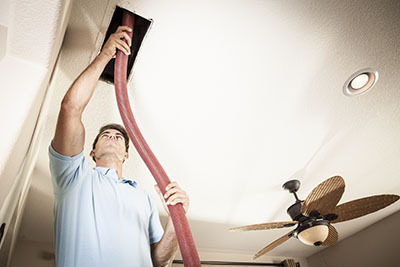 With HVAC parts and ducts checked, you will not have leakage problems or airflow blockage. Proper cleaning of the HVAC components with special attention to the condenser unit will exclude the possibility of airflow blockage. Annual maintenance will ensure that all parts are fixed and checked so that they can work efficiently. Checking the air ducts is even more important since they are even harder to access. Air duct cleaning will keep the tubes free of any contaminants and debris, but what's important about the overall duct inspections is that they will reveal any problem related to duct damage. With broken or poorly sealed ducts, you can expect energy loss. With air leaking, the HVAC unit doesn't work efficiently even if it's brand new. The air will not reach your home or at won't be distributed evenly at all rooms of the house. What good a new system will do if air finds other ways out in the ducts? That's why you are losing money and that's why air duct repair, good sealing and efficient insulation of the ducts will help you save money. With properly sealed and clean ducts you will save money spent so far on HVAC unit bills, repairs and replacement. Do you want to save some more? Don't just change the HVAC unit but also the ducts. If they are old and need plenty of "Band-Aids", it's best for you to invest in air duct replacement and the installation of solid, durable and well-insulated new ducts.